Top: 1929 Harley Davidson Model 45 "Pup". 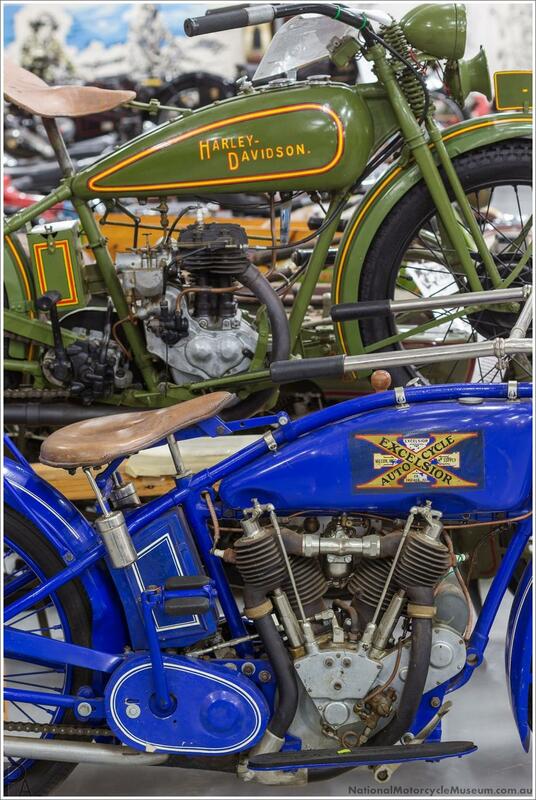 This 345cc side valve "Flathead" powered model was introduced in 1926 and remained in production until 1934. Bottom: 1919 Excelsior X. The US Excelsior company (there were British and German motorcycle companies with the same name) originally made bicycle parts in the late 19th century before producing their first motorcycle in 1905. The V-twin X series entered production in 1919 and were 61 cubic inches (1000cc) in size. The Schwinn bicycle company purchased Excelsior in 1911 (and later Henderson, around 1917) and many speed records and races were won by the bikes before the company was closed in 1931.